The last decade has seen a tremendous development in biological MS, and it is currently one of the fastest growing analytical techniques in biotechnology. The MS is the determination of the mass to charge ratio of charged species of molecules or highly specific fragments of these (as in GC-MS). These can be either positively charged or negatively charged. In the atmospheric pressure ionization (API) LC-MS techniques, ions are formed at atmospheric pressure and transferred into the vacuum of the mass analyzer. There are two predominant ionization techniques: Electro-spray ionization (ESI); and atmospheric pressure chemical ionization (APCI). In ESI the eluant from the column is sprayed though a narrow bore capillary to which a high voltage is applied (around 3 kV). This will produce a spray of highly charged droplets. The solvent is evaporated from the droplets by a heated gas, leading to shrinkage and disintegration to charged species through a complex process. The ions are formed either in the solvent before spraying or during the spray droplet shrinkage and the key parameters influencing the ion production are: solvent composition (surface tension, volatility, modifiers, pH, ion strength), source parameters (temperature, drying gas flow, potential), and interaction between analytes in the sample (Berkel 2000). The charged species are then sampled into the vacuum of the mass analyzer. In APCI the eluant from the HPLC column is sprayed through a co-axial capillary with a heated gas to evaporate the solvent. Evaporated solvent molecules are ionized by a corona discharge from a needle that is usually placed across the sampling orifice. Analyte molecules are ionized by chemical reaction in the gas phase at atmospheric pressure through a process much like the classical chemical ionization. The ions are sampled into the mass analyzer by a process similar to ESI (see Table 2). In general, ESI is the most versatile technique for a very broad range of bio-molecules and also the easiest to use, therefore ESI is also the most frequently used technique. 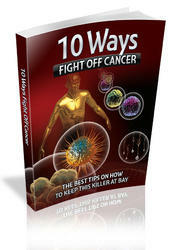 Not all molecules are ionized (usually protonated) in the positive mode, and are detected much better as negative ions. Gas phase chemistry is however not like solvent chemistry, and many carboxylic acids are much more efficiently protonated in gas phase by positive ESI than determined as anions in negative ESI. Negative ESI will give many fewer adducts and clusters than positive ESI, see Table 3, and so it is therefore easier to interpret spectra. However, a higher sensitivity can be obtained for some classes of compounds in APCI than in ESI. The charge to mass ratio is determined using a mass analyzer, which is either: Quadrupol, time of flight (TOF), ion-trap, sector (electric and magnetic) or an ion-cyclotron (ICR). These analyzers can be grouped into scanning analyzers (mass filters) where ions of just one mass to charge ratio can pass at a time and nonscanning analyzers where all ions entering the analyzer are detected (Table 4). 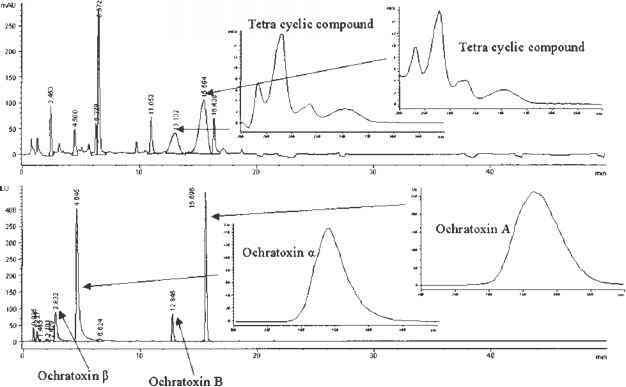 Mass resolution and accuracy are the two most important factors for the identification of compounds whereas sensitivity and scan speed are of most chromatographic importance. complexes are sometime seen e.g. charge determination. The performance of two common mass analyzers is shown in Figure 9. The TOF analyzer raw data (often called a continuum spectrum) show a resolution of approx 7500 (half height) and the quadrupole approx 900 (half height). Mass spectra are normally used as centroid (stick) spectra for mass determination where the stick is placed at the center of the continuum peak. This also reduces the disk space needed to store the spectra. Formula can be calculated from the mass, and with sufficient mass accuracy the number of possible structures is limited if sensible limits for composition are applied (Table 5). Combining a mass spectrometer with HPLC will allow the recording of mass spectra as peaks are eluted from the column. As was the case collecting UV-spectra, mass spectra are collected continuously with about 10-20 spectra across a peak to produce a data matrix containing both chromatographic and mass spectral information see Figure 10. Ion traces are highly specific chromatographic profiles of the samples which depend on the mass accuracy. Figure 10 shows an example of high accuracy ion traces corresponding to the protonated mass of puberuline (444.2287 Da) and xanthomegnin (575.1187 Da) both using a window width of 15ppm (6.7/8.7 mDa) showing only one peak in each; compare this to Figure 5. For each peak a mass spectrum can be retrieved, given structural information about the sample. In this case using an accurate TOF mass spectrometer also gives an estimate of peak formula. 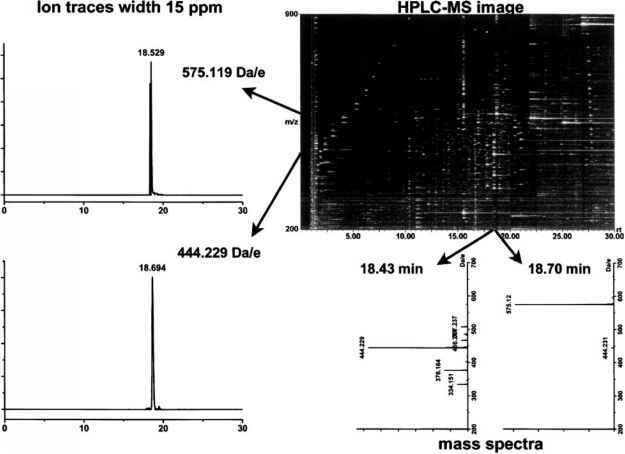 Comparing the HPLC-MS image in Figure 10 to the HPLC-UV image in Figure 5 there are significantly more details and higher specificity in the former of these two. The data shown on Figures 5 and 10 were acquired during the same run using a nondestructive UV detector in series with the MS to give the maximum information. a Using internal mass correction. Figure 9 Comparing mass resolution and accuracy of the puberuline M + H+ ion C27H30O3N3 mass 444.2287 Da/e) from analysis of a crude plug extract see the case below. A peak width at half height of about 0.06 Da and a precision of approx. 1 mDa (centroid data) is found by the TOF instrument (top) and a peak width of about 0.5 Da and a precision of approx. 30 mDa by the quadrupole instrument (bottom). acetate. However, trifluoroacetic acid should particularly be avoided in APCI (both positive and negative), whereas it can be used in low concentration in positive ESI. It is very difficult to run ESI in pure organic solvent due to volatility, and the limit seems to be around 90-95% acetonitrile-water, however ACPI works well in a pure organic solvent. ion traces corresponding to these can easily be drawn. It is then a simple matter to interpret. In most cases it is not necessary to use high resolution/accurate mass spectrometers for fungal identification. In practical identification, a combination of several metabolites with different retention time is used as a mark for each species thereby limiting the number of misidentifications. However it may be necessary to use more than one ionization technique, as some components are difficult to ionize in positive ESI. If the goal is to get a full profile of all metabolites produced under specific conditions for metabolomics, then high resolution/accurate mass determination is a major advantage, as it also provides the molecular composition of the ions. Figure 10 The HPLC-ESIMS data matrix showing both information about composition in form of chromatographic traces and mass information in form of mass spectra. Analysis of a plug extract from Penicillium cyclopium, IBT 16932, grown on CYA collecting approx. One spectrum/sec. With a mass resolution of 6000 and an accuracy < 5 ppm (Micromass LCT with lockspray). aI: Penicillium aurantiogriseum; II: P. freii; III: P. tricolor, IV: P. polonicum; V: P. aurantiocandidum; VI: P. viridicatum; VII: P. cyclopium; VIII: P. melanoconidium; IX: P. verrucosum and detected by TLC. b The metabolites can be detected by HPLC. sample, thus injecting a mixture of compound will give a mass profile of the sample. This approach was used by Smedsgaard in a study of the terverticilllate penicillia (Smedsgaard 1997b; Smedsgaard and Frisvad 1997). In that study, crude plug extracts from cultures were injected directly into the mass spectrometer in positive ESI mode with solvent and other parameters optimized to minimize fragmentation and cluster. Samples were used at low concentration to reduce matrix effects, thus avoiding "the winner takes it all effect." About 10-15 samples can be analyzed per hour by this approach, which have recently been used to study other organisms such as bacteria (Vaidyanathan et al. 2002) and actinomycetes (Higgs et al. 2001). Nine of the major species in the Pénicillium series Viridicata (The Pénicillium aurantiogriseum complex) were analyzed by direct injection on a quadrupole mass spectrometer (Smedsgaard and Frisvad 1996). Figure 11 shows crude extract spectra from three different species cultivated on CYA (Samson et al. 2000). The spectra show significant difference between the species and ions corresponding to the protonated mass of major known metabolites. These spectra can be stored and searched in a spectral database using the software included with most instruments, although this software in general is designed for EI spectra (Smedsgaard 1997b). To prove the concept in more detail a cluster analysis of the full centroid mass spectra (normalized) from 45 isolates of the nine major Pénicillium series Viridicata species (Figure 12) was performed. This cluster analysis is done directly on the centroid spectra with 1 Da resolution using the correlation coefficient and UPGMA linkage. As it can be seen from Figure 12 most species cluster together, however P. aurantiocandium is found in the P. cyclopium and P. tricolor clusters. One P. viridicatum is grouped with P. aurantiogriseum and another is an outlier. The ions (metabolites) that are important to the segregation of the species can be found using Principle Component Analysis (PCA) as the PCA loadings (Figure 13). If we consider loadings above 0.04 or below — 0.04, 47 ions are found in the plot from the first three principal components. Of these, 15 ions correspond to the protonated ions from 15 of the most important metabolites produced by these species (out of about 28 metabolites). Furthermore five ions correspond to the 13C isotope of major metabolites. Five to six characteristic metabolites are not found as they are not produced on these media, however they can be seen in the mass spectra from some of the known producers. Four significant ions of unknown structure are found from the loadings plot at mass 205, 235, 243, and 274 Da.